Kitchen scraps transformed into a memorable lunch. Happily, I was hungry today when I landed on The Sausageterian blog, maintained by fellow FOODday contributor Sara Bir. An intriguing string of ingredients in her “Bulgur with Cabbage, Onions, Feta and Walnuts” inspired my own lunchtime concoction. I sauteed a spring green leek with a pat of butter, melted, and then added the remnants of my home-fermented pink (resulting from a blend of red and green cabbage) sauerkraut to the pan. Then I chopped up my last long-forgotten, almost dried apple texture, freckled Goldenrush (my last one!) and added it to the pan. Meanwhile, I poured boiling water over the 1/2 cup of bulgur I had to use up and simmered a cup of quinoa on the stove. When the veggies had sauteed about 10 minutes, I added them to the cooked grains. I served it with some crumbled ricotta salata and a drizzle of a fig-infused balsamic glaze from some fancy foods store. And dotted it with some diced green garlic on top. What a tangy, satisfying dish that will still be difficult to recreate. Dan thought for sure it had pork in it. That’s probably just because we associate sauerkraut and apples with bacon, as I’ve braised them together before. 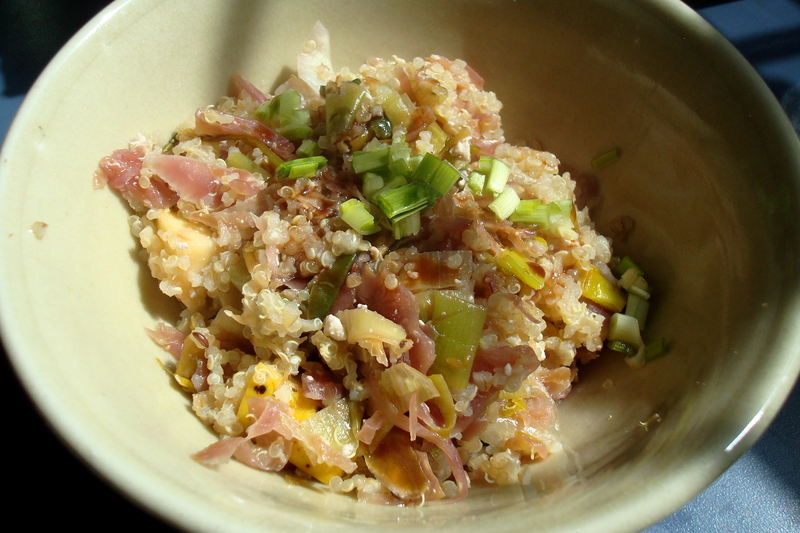 The chicken broth I simmered the quinoa in was the only meat product involved. Now a little browned lamb or pork sausage could be crumbled into this mix. That’s something I bet The Sausageterian would approve of.